I’ve disappeared from blogging for quite a while – much longer than I anticipated after the birth of our 6th baby. I’m going to slowly ease back into some semblance of a blogging routine. However, I’ll admit that I’m not very motivated at the moment. Why? Because this homeschool year is HARD! I had a busy summer and didn’t feel fully prepared when we started our school year. Normally I have notebooks set up, papers printed, and materials organized. Not so much this year. I’ve changed up some of our curriculum. I’ve had to throw some of our plans out the window and change them as I realized that some things were not working or were not going to get accomplished this year. Our year was sabotaged in the first few weeks. Have you seen the Epipen pricing coverage that’s been on the news? Well, CBS filmed their footage from my living room, kitchen, and basement. Oh my goodness! My family was filmed on 3 different occasions and our story was featured across the country. Overwhelming much? The school year has been busier than usual. We have our regular activities of AWANA, American Heritage Girls, and Trail Life. But after being on the summer swim team, my 4 oldest kids decided to try out for a year-round team in our area. They ALL 4 made the team – which is exciting but very, very busy! We had a baby, remember? I’m still trying to find our new routine with adding child number 6 to the mix. I feel like I’m struggling though and it’s been 6 months already! Our schedule has gone through multiple makeovers. Normally we find a workable routine within the first month of school. Not this year. I’m constantly working and reworking our schedule to make everything fit and still have time for free play and exploration. This has been so challenging for me! We got a puppy. And while she’s been super sweet and doing well with house training, she’s still a puppy and requires lots of supervision. It takes up a lot of our time and often destroys our schedule. I’m tired and unmotivated. All of the things listed above have made me feel more run-down and unmotivated than usual. When the alarm goes off in the morning, I just don’t want to even crawl out of bed. So…….our homeschool year has been hard. Well, I don’t have any profound answers. Homeschooling is hard. It’s filled with sacrifices. It’s time consuming and tiring. It’s a huge blessing and a wonderful ministry. But sometimes you just don’t view it that way. In the messy moments it feels more like drudgery. How’s that for honest? Sometimes you don’t enjoy being around your children all day. Sometimes your curriculum doesn’t work out. Sometimes your plans fall through and your schedule is overwhelming. Sometimes subjects are overlooked. Sometimes learning isn’t beautiful and exciting. Sometimes you drag your students through the day while they are kicking and screaming. Sometimes you drag yourself through the day, wondering why you even try. Despite my color-coded schedule, organized notebooks, cheerful homeschool room, and well-laid plans, homeschool is hard. That’s where I am this year. My days feel never-ending. I try to be enthusiastic about each subject. I try to revamp my plans and stay flexible. I change curriculum to better fit our needs. I plan, and I strive, and I work, and I keep powering forward. And nothing gets easier. And I become discouraged. So this is me, in my 6th year of homeschooling, saying that I don’t have it all figured out – admitting that this educating and parenting thing doesn’t get any easier. As homeschool moms we can be honest with each other. Extend yourself some grace. 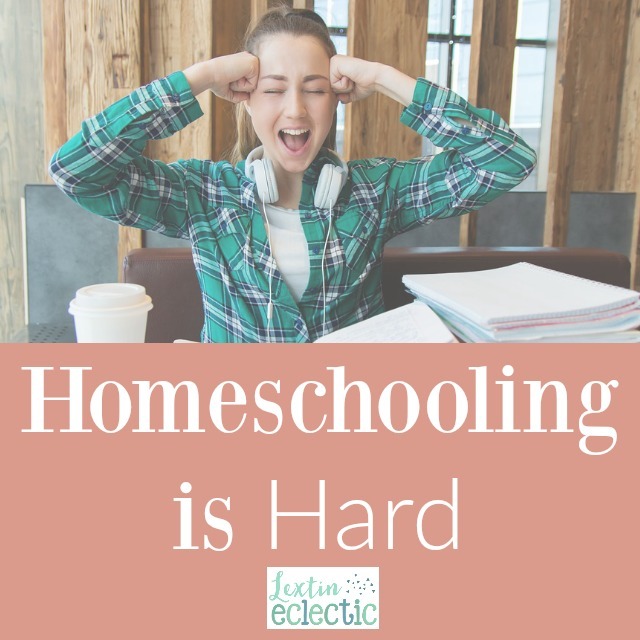 Know that homeschooling isn’t supposed to be easy. But it is worth it. I know homeschooling is my calling for this season. And I have to rest in knowing that I’m where God placed me, and He’s able to work through me in spite of my messes and failures. Have you been in a place of homeschool burnout? How do you overcome? *I’m convinced that homeschool moms go through cycles of burnout. Read my thoughts on homeschool burn out as well as tips for when you’re not motivated for another school year.